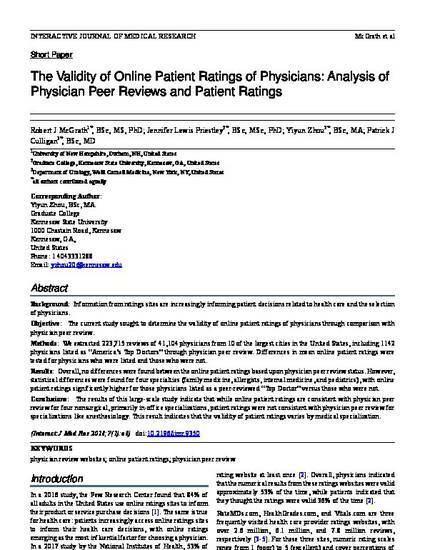 Results: Overall, no differences were found between the online patient ratings based upon physician peer review status. However, statistical differences were found for four specialties (family medicine, allergists, internal medicine, and pediatrics), with online patient ratings significantly higher for those physicians listed as a peer-reviewed “Top Doctor” versus those who were not. Conclusions: The results of this large-scale study indicate that while online patient ratings are consistent with physician peer review for four nonsurgical, primarily in-office specializations, patient ratings were not consistent with physician peer review for specializations like anesthesiology. This result indicates that the validity of patient ratings varies by medical specialization. ©Robert J McGrath, Jennifer Lewis Priestley, Yiyun Zhou, Patrick J Culligan. Originally published in the Interactive Journal of Medical Research (http://www.i-jmr.org/), 09.04.2018. This is an open-access article distributed under the terms of the Creative Commons Attribution License (https://creativecommons.org/licenses/by/4.0/), which permits unrestricted use, distribution, and reproduction in any medium, provided the original work, first published in the Interactive Journal of Medical Research, is properly cited. The complete bibliographic information, a link to the original publication on http://www.i-jmr.org/, as well as this copyright and license information must be included.